Does the headline “five apps to download before attending an event” or something similar sound familiar to you? If you go to conventions or conferences, it probably does. People attend events to network and to see what’s new in a specific field, whether it’s a corporate conference or a lifestyle trade show. They want to create meaningful connections, expand their network and learn more about customer and supplier bases, partners, competitors and the overall market. The main task of convention centres and other meeting venues is to establish an optimal setting for letting people do what they came for. So how do you create that setting? Well, who better to ask than those who attend events themselves? We talked to some experienced event visitors about the factors and features they deem most important for successful events: Our skilled are sales managers! Networking is the real keyword when attending events. That much is clear after talking to our area sales managers. People don’t just visit conventions and conferences to make themselves known to others, they also wish to spark interesting conversations, learn what’s what and create connections. A successful event equals reaching the right people, having meaningful conversations and potentially exchanging contact information. Using various events technologies, convention centres and meeting venues can support visitors in their networking endeavours. Reaching the right people may sound easy, but it could actually be hard work if the right information isn’t easily accessible. If you provide adequate information, you can help your attendees get as much out of their visit as possible - and ensure that they’re coming back. 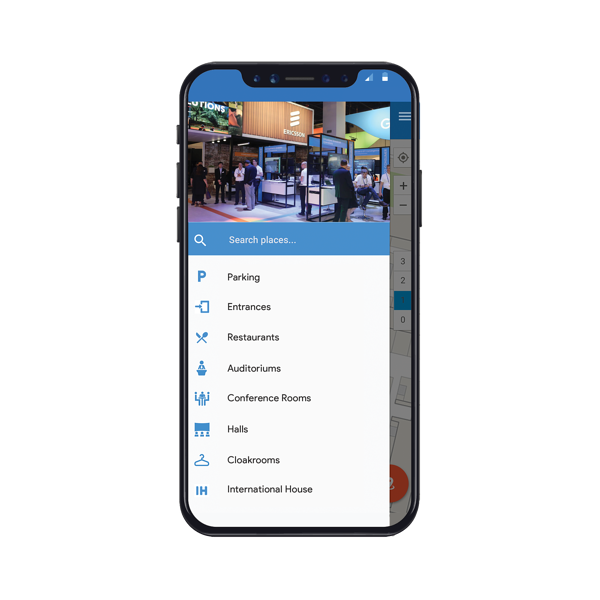 A native app in your convention venue is a good way to provide visitors with a one-stop-shop to facilitate networking. As mentioned earlier, there are lots of different blogs on google that recommend 4-5 different apps for successful event attendance. But flicking between apps is unhandy and annoying for visitors who want event information, find specific stands or sessions, collect digital business cards, take notes as well as schedule meetings. If you have an app designed for your event or venue, you can combine all those features in one app - with unique branding opportunities for you and your sponsors. “The most important digital event tool for me is without doubt a native app. I don't want to wander around looking for the kiosk or get some half-informed helpdesk guy that was a contract hire just for the event. I don't want a website either, since the WiFi is almost always so overloaded the site can't load. Give me an app with all the info I need, cached locally, every time” - US area sales manager. Everything you do that makes life easier and saves time for your attendees will make them appreciate your event or venue even more. We know that having an app with a top class wayfinding tool isn’t the thing that makes or breaks your attendees’ networking efforts. It does, however, help them focus on their main task, namely finding potential contacts and creating meaningful connections. Having your venue digitally mapped helps you customize your venue layout to the way people actually move around, it supports your attendees in smoothly and quickly finding the right people to talk to and it facilitates planning and preparing. When attendees reflect on the success of an event, they typically quantify the outcomes: How many stands did I get around to, how many meetings did I book, how big is my brand new pile of business cards, how much did the event cost compared to what I gained? In the spirit of making life easier for event visitors, those data can all be collected in a native app, making it possible for you to show your attendees exactly how much your event helped them. It all comes down to this: When your visitors feel well-prepared, well-informed, comfortable and networked, they’ll come back! Do you want to know more? Check out our blogs about our indoor navigation solution for the Huishoudbeurs lifestyle convention in the Netherlands and how we helped RAI Amsterdam turn their idea into a live solution in less than four weeks.